Hello, and welcome to AVCS! I am Korbin Bandy, the Middle School Social Science Teacher. I grew up in Murrieta California before moving to Orange County to attend UCI. From there I graduated with a BA in Political Science and MA in Teaching. 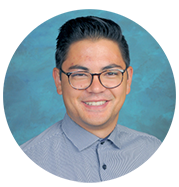 I student taught at Pacifica High School in Garden Grove, and since then I have been working here at AVCS! I have a wonderful, loving wife who works in Irvine and we both live in Costa Mesa. We enjoy traveling, eating, and spending time with each other and our families. In my class students will learn all about the world around them and will learn how we can connect to the stories of our forefathers and the stories of people from all over the world. My main goal is to teach students empathy, compassion, critical thinking, historical thinking, and the development and impact they can have on the world around them. All of these goals are met in a Christ-centered environment where students will gain an appreciation for the world God has given us and how we can use his teachings to improve our own lives and the lives of others. I look forward to meeting you, and once again, welcome to AVCS!